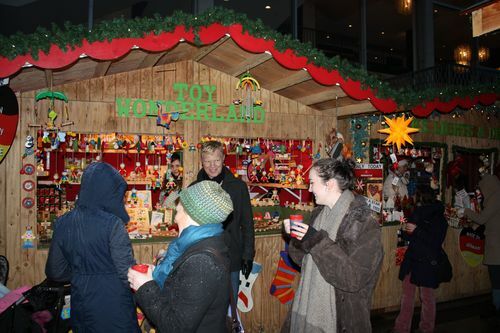 It was my first time experiencing the Vancouver Christmas Market and I was really impressed. Definitely brought back memories of Christmas Markets in Germany and considering that it's only been around since 2010 the organizers have done a really good job. Most of the wooden huts were selling authentic, hand made, high quality items: super interesting soaps, chocolate, really cool wooden toys for kids, Christmas decorations, embroidery, and pottery. And then lots of food and the mandatory "Gluehwein". Without this mulled wine it just isn't a Christmas Market German style. If you were hungry - it is hard to choose from German sausages and bretzels to waffles, Flammkuchen, Schnitzel, BlackForest Cherry cake, and roasted chestnuts. When we arrived there was no entertainment for the first hour and it would have been lovely to hear a choir singing or even just some nice Christmas music. And the Carousel was fabulous - kids loved it and next year I will go for a ride! Overall - I thought a bit expensive but I will be back!